Mount Birów rises 461 m above sea level. It is one of the characteristic hills in the area of Podzamcze and Ogrodzieniec. The picturesque rocky hill with a good view on the surrounding area was already a site the Neolithic settlement. 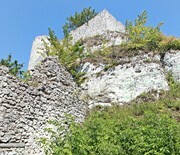 Especially, the top parts of the hill, which form a depression surrounded by limestone outcrops, have important defensive qualities. 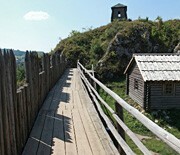 Today, we can see a reconstruction of the Slavic settlement here. Tickets : Price list on the website. Comments : Depending on the weather conditions. Zapraszamy na audiowycieczkę po Górze Birów! Zapraszamy na przygotowaną specjalnie dla dzieci audiowycieczkę po Podzamczu! Zapraszamy na przygotowaną specjalnie dla dzieci audiowycieczkę po grodzisku na Górze Birów! There are places where you can feel really comfy. “Suchy Połeć”, which can roughly be translated as “Big Piece of Bacon”, also called “Suchy Palec” – “Dry Finger”, is a distinctive rock formation near the center of Podzamcze. In this region, there are German bunkers from the Second World War. They were part of the so called Ostwall, a fortification line whose task was to prevent the Red Army from invading the areas of Upper Silesia. Although the Soviet-German fighting in the nearby areas was fierce, the bunkers themselves did not play a bigger role, however. In Podzamcze, on the road leading from Ogrodzieniec to Pilica, in a charming place, there is one of the Marian shrines. 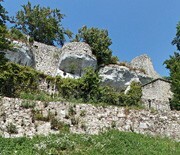 In this place, the cult of the Mother of God goes back to the first half of the nineteenth century, when Saint Mary appeared on the rock to one of the local residents. The chapel itself is a new object and dates back to 2000. The solemn ceremony of the foundation of the Shrine of Our Lady of the Rock climbing took place in 2002. 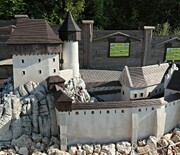 You can learn about the castles and forts of the Polish Jura in just several minutes in the Miniature Park Ogrodzieniec! With great care and knowledge, 16 fortresses along the Eagles’ Nests Trail have been reconstructed here. 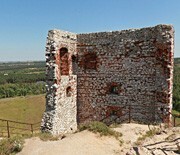 In a picturesque setting, at the foot of the ruins of the castle of Ogrodzieniec, miniature castles from the period of their greatest prosperity have been recreated, preserving the natural environment of each of the buildings. 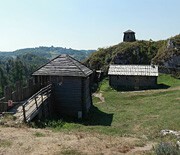 There are also medieval siege machines, and recently - a replica of the monastery of Jasna Góra. 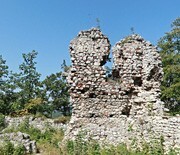 The Ruins of Ogrodzieniec Castle in Podzamcze. Ogrodzieniec Castle is the largest castle of the Kraków-Częstochowa Upland and, undoubtedly, one the most beautiful castles in Poland. 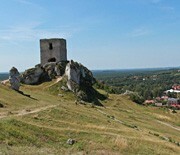 It is located on Mount Janowski at the heart of the Upland. 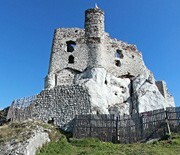 Fantastic rock formations, which were used to construct the castle, make the majestic ruins even more picturesque. 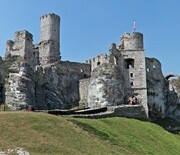 The castle is situated in the central part of the Polish Jura and it is easy to get there. The red marked Eagles' Nests Trail runs nearby. The present church of the Transfiguration in Ogrodzieniec, stands on the site of a former wooden shrine of Saint Lawrence (which existed here since the Middle Ages to the mideighteenth century). The church was under construction off and on since the 50s of the eighteenth century. 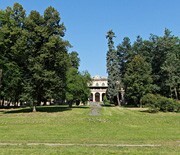 The last stages of the construction fell on the years between 1783 and 1787, when the owner of Ogrodzieniec was Jan Józef Jakliński. The church combines the late Baroque and neo-Classicist styles. The brick building has a lofty tower. POZIOM 511 Design Hotel & SPA to 4-gwiazdkowy obiekt położony w sercu Jury Krakowsko-Częstochowskiej. Lokal gastronomiczny na terenie Zamku Ogrodzienieckiego. An error occurred while loading the weather forecast.